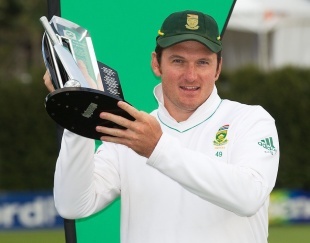 Few could deny that South Africa deserved to win the Test series against New Zealand. They were, as their captain Graeme Smith said, "on the front foot" most of the time. Their bowling was pure class, their batting got better as the series went on and they kept New Zealand under pressure throughout. If anything, the victory could have been by a bigger margin than 1-0. Had rain not affected the first and third Tests, had Smith left New Zealand a few more overs to face in Wellington: these are the what-ifs that will remain. Smith had to perform a tricky balancing act on the final day, knowing that a draw was enough to seal the series but a win would make the scoreline more emphatic. He could have dangled a carrot and set New Zealand a chaseable target, but waited till the target had swelled to 389 runs off around 80 overs before declaring. Smith said he did not want to give the hosts any chance of levelling the series, since it was one South Africa had dominated. "I don't think New Zealand deserved anything more," he said. "Being 1-0 up in the series I didn't think they deserved any more." Smith's statement suggested he did not think New Zealand had earned the right to be in with a chance of victory, and he was not going to allow them one with a sporting declaration. New Zealand had been behind in the Test right until the final day. After putting South Africa in to bat, they conceded 474 runs, despite South Africa having to bat through significant rain-delays. New Zealand collapsed in familiar fashion on the fourth day as they failed to contend with a display of pace bowling that will be remembered for a long time. They did finally get things right on the final day, battling with the bat to earn a draw, which according to Smith, was all they deserved from the Test. Smith said New Zealand were the team that had shown less intent to go after a win. "I felt New Zealand could have been more aggressive in their first innings," he said. "They never got to three runs per over throughout the Test match and maybe played a bit defensively through the middle part of the game. But we were aggressive throughout." Smith had the luxury of a bowling attack that is naturally aggressive but he said they had also batted with the same positivity. "We showed that last night with the way we came out and built a platform. This morning I thought we played positively from the get-go and scored well." AB de Villiers and JP Duminy helped South Africa score 114 runs in just over an hour on the fifth morning, at a rate of 7.92 runs per over. New Zealand never showed the same intent at any stage in the series, and Brendon McCullum admitted South Africa had been the team in control. "I think they deserved to win the series, they've been the better team throughout," he said. He also said he understood Smith's tactic to bat New Zealand out of the game before declaring. "They definitely didn't want to give us a sniff, and I completely understand that because they dominated the game for so long. They didn't need to entertain the thought of us winning." The gulf between the two sides has at times during the series seemed wider than Lake Taupo. However, there were phases when the contest was much closer. In each of the first two Tests, New Zealand bowled South Africa out for under 300 in the first innings. In every match, New Zealand have had a partnership that has threatened to take the game away from the South Africa bowlers. At every juncture though, New Zealand have stopped short of taking control and allowed South Africa to assert themselves. At those same junctures, South Africa have had answers. "We've competed at times and I guess we'll never know what could've happened in that first Test," McCullum said. "As a whole I think a fighting effort like we put up on this final day was a really good result. We had them on the ropes at times but I think 1-0 is probably a fair reflection of the series."